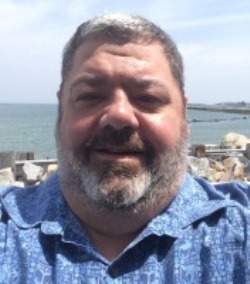 George D. Kouloheras, 54, of Lowell, a member of a well known Lowell family, died unexpectedly Sunday January 27, 2019 at his residence. Born in Lowell, Massachusetts on May 26, 1964 he was a son of Janice A. (Lefebvre) Kouloheras and the late James G. Kouloheras who died October 24, 2018. George attended the Franco American School, Class of 1978, and was a 1982 graduate of Bishop Guertin High School. He attended the University of Massachusetts Lowell and was a graduate of Newbury College in Boston majoring in Culinary Arts. With a life passion of culinary and hospitality, for over 30 years, George worked in the restaurant business beginning at the former Windsor Mills and Mill House Restaurants as a line cook, then chef and eventually becoming the General Manager. Following his years at Windsor Mills, he was the Food Service Director at Middlesex Community College at the Bedford campus for ten years. For the past four years, he served students, families and staff at EDCO Collaborative in Bedford, MA as their Director of Culinary Services. He also spent many years supporting the Hugh O’Brien Youth Leadership Foundation beginning with his own youth scholarship through adulthood as a mentor. George enjoyed the woods and camping and spent a near lifetime engaging and mentoring young people in leadership development through the local Boy Scouts of America programs in greater Lowell and the Merrimack Valley. An Eagle Scout himself from Troop 80 in Dracut, George was elected to Scouting's National Honor Society, the Order of the Arrow, and active in its local organization beginning in Wannalancit Lodge in 1977 through 2019 in Pennacook Lodge. George served as Lodge Chief leading greater Lowell and as Section Chief leading Massachusetts, New Hampshire and Maine and was conferred the Vigil Honor; a recognition he held with great pride and spirit. A second home to George was Wah-Tut-Ca Scout Reservation in Northwood, NH, a place where he and his Brothers in Scouting experienced many of life's adventures in outdoor skills, youth leadership, spirit and friendship. A special place where common, positive experiences bound together generations of scouts and where George always felt welcomed, loved and connected to the Earth and his Brothers. George will forever be remembered as not only the camp chef but as the camp historian, a trusted adviser, a loyal friend, and as one of its spirit keepers. For many years, George enjoyed summers at the family home at Camp Ellis Beach in Saco, Maine with all of his family and many friends. In addition to his mother Janice of Dracut, George is survived by his brother, Michael J. Kouloheras and his wife Melinda of Amesbury, MA; a nephew, Jonah Santiago of Amesbury, MA; two aunts, Daphne Zaralidis and her husband John of Lowell, MA and Elizabeth Kouloheras and her partner Arlene Hinckley of Barnstable, MA; two uncles, William Kouloheras and his wife Dede of Cape Coral, FL and Harry Kouloheras and his wife Joy of Tyngsboro, MA and many cousins and dear friends. KOULOHERAS—Friends may call at the O’DONNELL FUNERAL HOME 276 PAWTUCKET ST. AT FLETCHER from 4 to 8 P.M. Monday. Relatives and friends are invited to attend his Funeral Mass to be celebrated Tuesday morning at the IMMACULATE CONCEPTION CHURCH in Lowell at 11 o’clock. Burial will be private. E-condolences/directions at www.odonnellfuneralhome .com. Those wishing may make contributions in his memory to The Key Foundation, Inc. online at www.keyfoundation.org.. Arrangements by Funeral Director James F. O’Donnell Jr. (978) 458-8768. You both worked with George for many years. Lots of good memories. He will be missed and not forgotten. RIP Brother. Janice & Michael So Sorry to hear about your Son - Brother. We worked at the Windsor together. I had a lot of Good times & Laughs with George he will be Missed .